I was at the Saturday FTI Taguig yesterday after a month’s absence and I was thrilled to spot a new vendor with an interesting range of wonderful looking produce. The show stopper? Some of the freshest bamboo shoots I have ever come across in my market forays… they were a bit big, and still with leaves at the tips, but I bought one anyway, unsure what I was going to do with it (more on that in an upcoming post). The stall had a nice vibe, something that screamed “I am organic” or “I am proudly raised”, and sure enough, upon asking, it turns out everything in the stall was from a farm in Pitogo, Quezon and/or nearby suppliers. Totally organic, and using their own fertilizer/compost from vermiculture (earthworm based system). The okra they had on offer were nearly dangerously humongous, the size of small zucchini! But they assured me they were still tender and tasty, but I passed on those. Instead, I purchased a few other items that have ended up in the still life above. Haven’t had guyabano (soursop) in a looooooong time. It looks delicious! Me thinks you’re gonna make ginataang lechon with a bamboo shoot salad followed by a a refreshing soursop drink (hows your mixology skills btw?). Oh how I adore okra. MM, will those pale green eggplants turn violet? Or are those of a different breed which has green as their own color? Oh so that’s what the bamboo shoot looks like when fresh! I have gotten so used to buying cut up labong. The old folks always warn that the season when bamboo shoots are in growth is also aswang season. “Tigtalambo” is how the season is called. I grew up in an urban barangay in Bacolod City where there is an alleged neighborhood aswang living among folks near a creek. I have reason to believe he/she/it was on a strict low cholesterol diet since I was spared from aswang attacks. Hi MM! My uncle put bamboo shoots as gulay when he cooks dinuguan. Pwede rin ginataan with shrimps. Yum! Okra is like Mary Poppins’ spoon full of sugar, it makes everything slide down in the most delightful way. You’ll appreciate that as you age. I just bake or steam them whole so as not to release the gooey ropey sap that revolts a lot of people. @Lee, down our way, aswangs only stalk pregnant women who can keep them at a distance by leaving their hair uncoiffed and keeping crushed garlic in their person. Owls are said to announce the presence of aswangs which can be chased away with a whip made out of dried stingray tail or with the dried barbed snout of a sawfish. A Thai dessert which I like is just boiled cassava with panocha syrup and coconut cream, yum. You have to peel cassava, cut in big chunks and soak in water for an hour or two. Then just boil at least 4 cups water with a few pandan leaves. Drop in the cassava chunks. Boil until fork tender. Then add about 1 cup panocha. Low simmer until syrupy. Cool. The Thai-style coconut cream is 2 cups coconut milk, remove 1/4 cup to mix 2 Tbsp non-glutinous rice flour, then put back in, and 1/2 tsp rock salt, simmer until slightly thickened. Cool. A filling merienda. 1. slice thinly with a bolo, “kudkud” style. 2. boil the thinly sliced shoots in a little water, discard the water two to three times to get rid of the pait. 3. once tender, use as you would any vegetable. however, the ilonggos would prefer shrimps, saluyot and or okra, and gata. may also use alimasag instead of shrimps. Wow Labong!!! i always ask our secretary to bring home fresh labong whenever she goes to Bicol. No need to spend on sweet pasalubong, just bring me home Labong! I saw that labong dish in a restaurant in Cebu. MM , it has gata and malunggay leaves. i didn’t buy it, because i had the kinilaw na langka already. which is yummy too!!! Guyabano is the new medicinal fruit these days!! it makes them stronger. haven’t read it any article about it. they said it was featured in different tv shows already. MM you can make bamboo shoot pickles or make ginataang bamboo shoot with young kernel corn, okra, tagabang with either shrimps, crablets or alimasag, pair it with grilled porkchop, yummy. I love guyabano but always get frustrated with the ones I bought in the last few months. They were picked young so do not ripen properly and I always end up throwing them. However, I found and ate one in Davao City. Super delicious. P35 per kilo in the market. Anne…there is also Turkish orange eggplants…haven’t tried growing them yet though. I grew the Turkish eggplants once, tempted by the catalogue description. Flavour was OK if picked when still greenish, skins still were a touch bitter compared to other varieties but not bad and the flesh quite tasty. They do turn a spectacular orange but by then they are seedy and bitter. I’m not growing them again, since I much prefer the Italian/Japanese/Thai varieties I’ve grown. Thank goodness for locavores like you. And ofcourse nothing like good, pesticide/insecticide/chemical fertilizer-free fruits and veggies. It’s cherries, strawberries, berries, etc. season here in NY and I have yet to taste really sweet and luscious ones, so I stick to carabao mangoes from the Carribbean. we cook labong with santol which is also in season now. with some pork or shrimp plus saluyot… delicious. guyabano is a bit scarce now a days as lot of those sick with cancer is using it as a drink/juice as it cures the cancer cells. Hi Mr. Market Manila. I was your vendor. Thanks a lot for dropping by at our stall @ AANI – FTI. I hope to see you more often there and so with the other bloggers. May I please correct my contact number? Its now 09228776493. We accept orders for any exotic fruit and/or vegetable requirement. If just incase we dont have them yet, we will try to grow them for you… Go for naturally farmed fruits and vegetables even meats too! I missed all this fruits and vegetables. We were able to get fresh bamboo shoot last week from a Cambodian store and was so excited about! These produce really look fresh! Good things are hard not to see ! Sister ko yan!!! 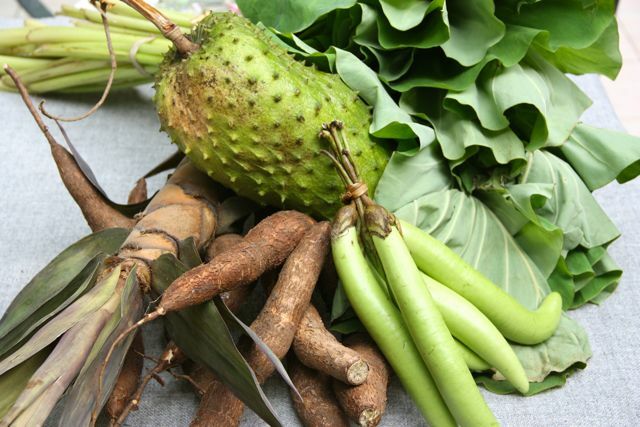 Did you know that Guyabano is good for Cancer cure daw…. My kids and I love guyabano. Ate wENG is a good friend of ours. Happy to know that they are doing good in the market. hmmmm, ate, can i buy some guyabanos please? Yum! I miss guyabano shake. . . . . Your fruits and veggies looks delicious Tita. . .	sarap mag ginataang labong. . .
Hi, are there any other organic market in manila? Is Distributing Cash at the Presidential Palace Improper? Immoral? Insensitive? Idiotic? Infuriating? Which Restaurants will you be taking Balikbayans to this Christmas Season?? ?